e3: Career and professional development made easy! 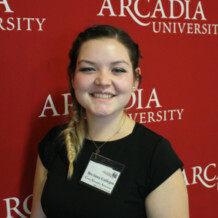 Designed for Arcadia undergraduates, the e3 Career Action Plan provides an easy to follow, clear, and step-by-step career exploration and professional development program. You will also receive incentives (free swag!) after completing each of the plan’s three levels (explore, engage and embark). 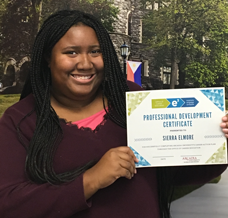 Along with newly enhanced career readiness, once you successfully finish all three levels, you will also obtain an e3 professional development certificate. After completing any level, pick-up your free swag in Knight Hall, Suite 100 during Express Advising hours. Through Handshake, e3 career actions are sequenced making e3 easy for you to follow. However, don't worry about completing the e3 actions in the exact order. If you have completed an e3 action previously, go ahead and check it off your plan in Handshake. "As a student, there were a lot of times where I thought I didn't know where to start when it came to preparing for jobs and grad school. I also tended to think "I don't need to worry about this yet - I'm only a first-year student, sophomore" etc. When it came time to start getting ready for the real world, I didn't know where to begin and what skills I really needed. e3 is great because it gave me the groundwork to know where I was headed and how to get there. I like that it is broken down by suggested school year without being so rigid to feel like I am pressured with another due date or deadline, and I could kind of jump around. This structure was also nice because I was able to see things farther down on the list that I had already completed while being at college, so I didn't feel like I was completely starting from scratch and I felt more prepared and a lot less overwhelmed. I wish this program would have been around when I was a First Year when I was intimidated by all of the events and expectations of a college student. While the main goal of the e3 Program is building those skills, the incentives weren't half bad either!" "You can learn new things, and earn free things! Through the OCE's resources, participating in networking nights, and completing several practice interviews, I learned how to succeed in a professional interview and to ask thought-provoking questions. I liked that there were clear, detailed steps directly tied to actions that improved our careers. The sum of my experiences has led me to land my dream job as an HR Analyst at Citigroup in New York City, starting in the summer of 2019!"